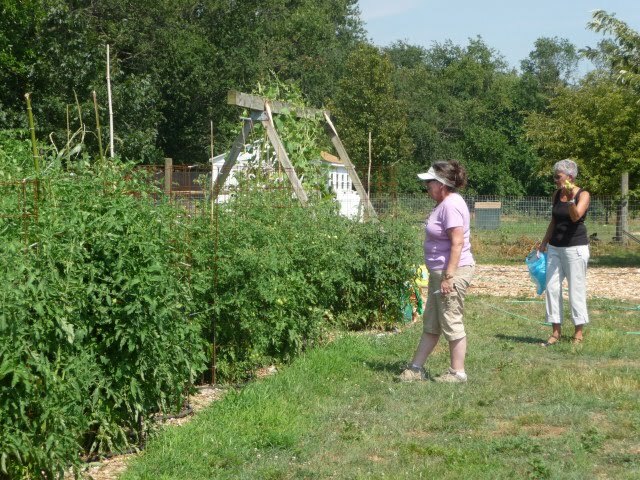 When I get to the community vegetable garden at Victory Farm – arriving late and in 90-degree afternoon heat, my apologies again, ladies — there are nonetheless still four women there watering, plucking a rare weed, picking a few peppers and confabbing about the next harvest. Most of which goes to the Kent County Food Pantry. The garden, tended by nine volunteers, most, but not all of whom are Master Gardeners, was the brainchild of Barbara Ellis, a beyond-the-call-of-duty expression of Plant a Row (PAR) for the hungry, a program begun by the Garden Writers Association (GWA). The program urges gardeners to plant an extra row of tomatoes, carrots, lettuce, whatever with the intention of donating the produce from that row to their local food pantries. Begun in 1995, the national program has donated over 14 million pounds of vegetables and herbs to feed the hungry. 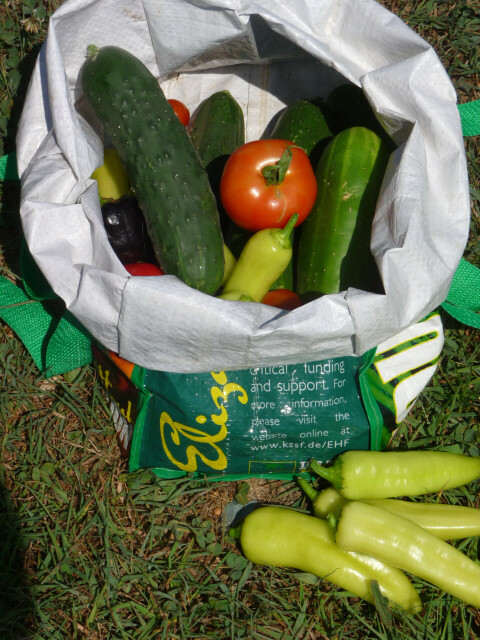 Ellis, a GWA member with a horticultural degree, has spent the last couple of years collecting extra produce from Kent County gardeners to donate to the food pantry. This year, thanks to the donation of a whole field by Sarah Ruckelshaus, owner of Victory Farm and head of Mid-Atlantic Border Collie Rescue, Ellis considerably expanded her horizons to planting way more than a single row. The garden, hemmed on one side by fencing (to keep Ruckelshaus’s sheep from both ravaging the place and escaping), at a guess is 15X 50 feet, and is planted with beets, lettuces, peppers, sweet potato, shallots, carrots, peas, lima beans, herbs, pumpkins, gourds, and a veritable forest of tomatoes –38 incredibly robust plants barely contained by a regiment of volunteer-made cages. Among other things, the group has so far donated 40 pounds of mesclun (about a 55-gallon drum in volume) to the food pantry. Everything in the garden is grown organically. 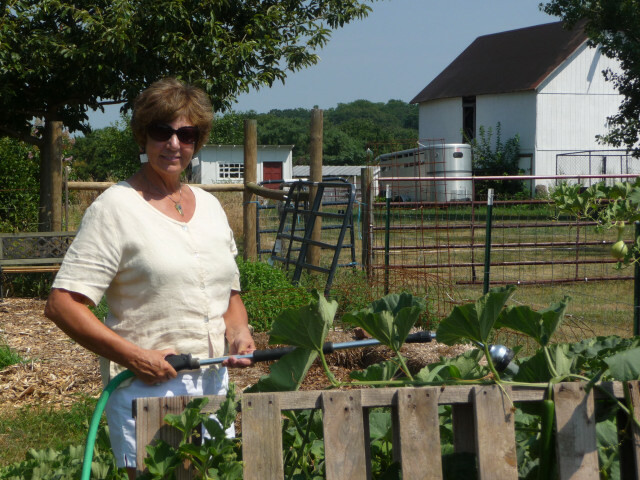 The volunteers, some of whom are UMD Master Gardeners, who can apply time spent in the garden toward their required annual volunteer hours, do a rotation on the labor of harvesting and watering, a key component in this drought. There is very little weeding required, the result of careful planning and mulching. “You don’t want to ask volunteers to weed in August!” says Ellis. As a reward for the labor, volunteers can take whatever they want from the harvest for themselves. But most has gone to the pantry. Some have home gardens themselves and don’t need the extra produce. They have also seen some people donate produce to the pantry that they themselves don’t want – oversized zucchini, slightly aged beans or peas — and know from first-hand experience that over-the-hill produce is not only not chosen by food pantry patrons, but puts a burden on pantry volunteers, who must them dispose of it. So, as a matter of both pride and fellow consideration, the community gardeners want to give the very best they have to offer. In addition to mesclun, they have already donated beets and shallots, and are now prepping the beds for a second planting of beets as well as Brussels sprouts and probably some turnips for fall harvest, the seed for which is mostly donated, the result of Ellis’s status as a garden writer. (Seed companies send you things to trial and then – they hope, and we usually do – write about them.). This year’s garden was an experiment to see if it would work, if there would be enough sort-of-steady volunteers to spread the burdens of the enterprise fairly evenly across more than one or two pairs of shoulders. So far, more than so good as evidenced by the dedicated volunteers picking and watering here today. But before then, the group will happily accept donations. (Maybe it’ll work for your tax return retroactively, maybe not, but whatever. It’s a worthwhile project.). Money is always welcome, but materials are too. They want to build a small shed to hold tools since the volunteers are all carrying their tools around in their cars. They also need leaf grow and manure this fall to bed down the garden for next summer’s planned expansion. This experiment, a labor of love to benefit the community at large, has been a success so far, one all the participants hope to build on. While we prefer e-mail, we understand that not everyone else does. Please restrict phone calls to 8 am to 8 pm EST. 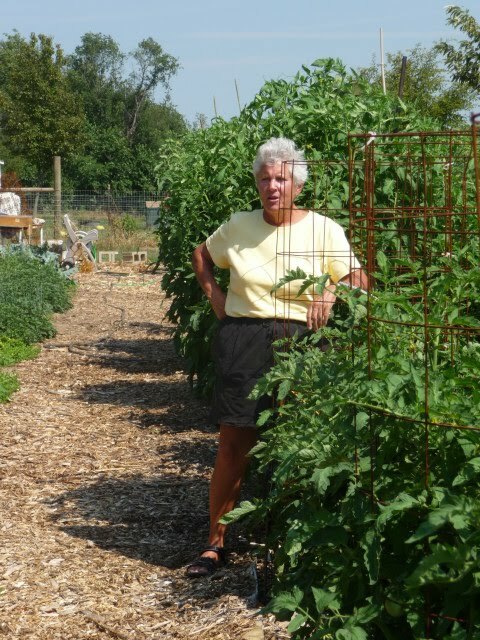 Nancy Robson is the writer/editor of the ChestertownSpy.com’s garden and food sections.